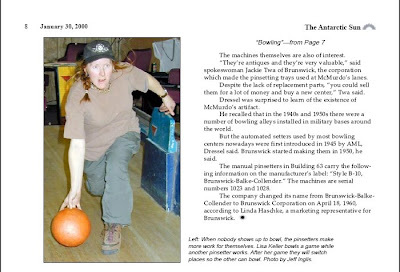 Housed in the basement of McMurdo’s Building 63 are two bowling lanes, one of a few remaining manually-set alleys in the world. The exact number is difficult to know, because they are so small and so rare. The lanes were the site of last week’s bowling tournament final match, won by the Freshies, with the help of the people behind the pins. 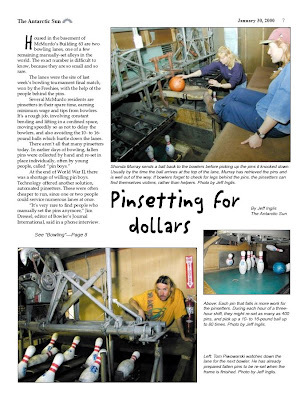 Several McMurdo residents are pinsetters in their spare time, earning minimum wage and tips from bowlers. It’s a rough job, involving constant bending and lifting in a confined space, moving speedily so as not to delay the bowlers, and also avoiding the 10- to 16-pound balls which hurtle down the lanes. At the end of World War II, there was a shortage of willing pin boys. Technology offered another solution, automated pinsetters. These were often cheaper to run, since one or two people could service numerous lanes at once. “It’s very rare to find people who manually set the pins anymore,” Jim Dressel, editor of Bowler’s Journal International, said in a phone interview. The machines themselves are also of interest. “They’re antiques and they’re very valuable,” said spokeswoman Jackie Twa of Brunswick, the corporation which made the pinsetting trays used at McMurdo’s lanes. Despite the lack of replacement parts, “you could sell them for a lot of money and buy a new center,” Twa said. Dressel was surprised to learn of the existence of McMurdo’s artifact. He recalled that in the 1940s and 1950s there were a number of bowling alleys installed in military bases around the world. But the automated setters used by most bowling centers nowadays were first introduced in 1945 by AML, Dressel said. Brunswick started making them in 1950, he said. The manual pinsetters in Building 63 carry the following information on the manufacturer’s label: “Style B-10,Brunswick-Balke-Collender.” The machines are serial numbers 1023 and 1028. The company changed its name from Brunswick-Balke-Collender to Brunswick Corporation on April 18, 1960, according to Linda Haschke, a marketing representative for Brunswick. It was a windy day out over the sea ice. Coast Guard Lt. Tom McDevitt, the pilot, and flight mechanic Mark Henley were checking out sea ice conditions and “waving the flag” at the tourist ships in McMurdo Sound. McDevitt answered, “400 pounds,” but later revised his plan, noting Henley’s implicit suggestion that the wind would be against them on the trip home. The men are part of a 14-person Coast Guard helicopter crew temporarily stationed in McMurdo. Normally based either in Mobile, Alabama, or on one of the Coast Guard’s icebreakers, the team is now flying their two aircraft from a pad near the Chalet. The crew, who call themselves the “Hammerheads,” but whose name is officially Aviation Detachment 146, started preparing for this trip in September. They did a lot of work on the helicopters, to be sure they’d be in top flying condition. In October, the team flew to Seattle to meet up with the Polar Star for its cruise south. On the journey to Antarctica, they passed through areas of the Pacific Ocean that don’t normally get visits from the Coast Guard. helps U.S.-based crews enforce the law more effectively. “We go to spots where most of our Coast Guard units don’t get to go,” said unit leader Lt. Cmdr. Rich Jackson. As well, the ship and helicopters were always on call for rescue missions, had there been vessels in trouble nearby. The trip to Antarctica and back takes six months. Jackson has planned for 300 hours of flying during that period, and expects to use it all. Some of it was spent on the way down, and some will be spent on the way back. But most of the flying happens around Ross Island. The helicopter crews are doing all kinds of work, from remote weather station maintenance to morale flights to the ice edge. Most of their work involves support of the Polar Star, doing reconnaissance of ice conditions before the ship begins breaking ice, or ferrying people and equipment between the ship and the land. “It’s probably the most demanding flying that we do in the Coast Guard,” Jackson said. The weather conditions and logistics make it much more difficult than flying from a ground station in the States. Not only do the helicopters have to carry skis on many missions over ice, but the crews need extra survival gear. Fuel-use margins are also stricter here, where weather can ground flights for long periods. The ship can help, by positioning itself at a midway point in a long route, so the helicopters have somewhere to land if the weather turns ugly. But even landing on the icebreaker can be very difficult: The ship’s hull is rounded for better icebreaking, but that means it rolls more in the waves than would a vessel with a sharper keel. “We fly all over the world and sit there a while,” said rescue swimmer Steve Lurati, who has a brand of laconic sarcasm similar to the crew members. In a way, he’s right. Jackson pointed out that Lt. Scott Craig, the engineering officer, much prefers scheduled maintenance to fixing broken equipment. So the mechanics work hard on regular preventive work and mostly avoid repairing parts on short notice. Jackson also said this is the most motivated crew he’s worked with on the Ice, which helps because, as with everything in Antarctica, nothing goes exactly as planned. “It’s never the same game twice,” he said. The crew will be in McMurdo until the icebreaker departs with the Greenwave for the return journey to the U.S. The helicopters will fly off the breaker in San Francisco in April, and head back to Alabama. At South Pole Station, in the middle of the polar plateau, people keep showing up. While most fly here on LC-130s, there are a growing number who can say they got here by land. Just the other day, seven men in bright orange jackets appeared outside the station. They were Argentinians who had driven snowmobiles from Belgrano Station near the Weddell Sea, at the same latitude as McMurdo. It had taken them 38 days. The previous day, nine skiers had arrived from the Weddell Sea coast. Among that group were the first British women to travel overland to the pole, the first married couple to do so and the first Australian to visit both poles. A significant spot in an otherwise featureless landscape, the South Pole is an appealing goal for Antarctic adventurers traveling on the frozen plateau. Mike Thornewill, of the multinational expedition, said he has been trying to get here for 30 years. “I couldn’t get a plane so I had to walk,” he said. His wife Fiona, one of the first British women to get to the pole on skis, was equally pleased. “It’s such a privilege to be here,” she said. The expedition was a fundraiser for the Marie Curie Cancer Care charity. They have already raised $150,000. It’s part of their effort to involve large numbers of people in the endeavor, which saw them travel 730 miles in 61 days, each pulling a 200-pound sledge. “If you’re going to take money from the community to do something, you should give something back,” Mike Thornewill said. But the effort is also for the individuals on the team. “We have a dream and an earnest desire to make our dream come true,” Thornewill said. For the Argentinians it was different. They were on a scientific traverse and intended to camp near the pole for a couple of days before returning to their station, said expedition doctor Nicolas Bernardi. Other expeditions to arrive at the pole, or to declare it as a destination, included several groups hoping to celebrate New Year’s at the end of the Earth. Four Singaporeans and four British arrived on skis in time, while nine others flew in from Patriot Hills just to spend midnight at the pole. The conditions continental traverses face today are very similar to those the early explorers endured. Clothing and shelter are of better materials, but hauling sledges across sastrugi isn’t much easier. Living conditions are still quite spare, the Thornewills agreed. “I’d forgotten what a clean cup looked like,” Mike said. Even in these tough conditions, though, it could be worse. “It’s kinder here than in the Arctic,” said Grahame Murphy, the first Australian to visit both poles. He went to the North Pole in 1994, and would gladly trade the Arctic sea ice for sastrugi on the southern polar plateau. The desire for primacy in arriving at the pole results in detailed descriptions involving nationality, gender, level of support, method of transportation and the route traveled. For example, Catharine Hartley and Fiona Thornewill were the first British women to arrive at the pole on skis from the coast. When expeditions arrive at the pole, they are welcomed by station staff, who usually have had some warning of the arrival. They’re treated to hot drinks in the galley, and are often shown around the station’s science and support facilities. It’s a welcome quite different from the one Scott saw, with a Norwegian flag flying atop an empty tent in the middle of the white desert.